Get to know your AccuQuilt die cutter and dies in this new monthly club! February's project is Qube's Best Friend (Pillow), using the 8" Qube, Angles Companion Set, and 2 1/2" strip dies. 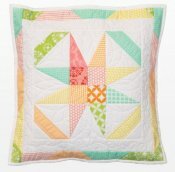 In this class you'll use our AccuQuilt die cutter and dies to cut your pieces for your pillow top. Piece your pillow top in class and see how perfectly your quilting projects will come together when you cut your pieces with your AccuQuilt! This class is for quilters who have some experience with piecing a 1/4" seam, basic rotary cutting skills, etc. No AccuQuilt die cutter or dies? No problem--use ours in class to cut your pieces!